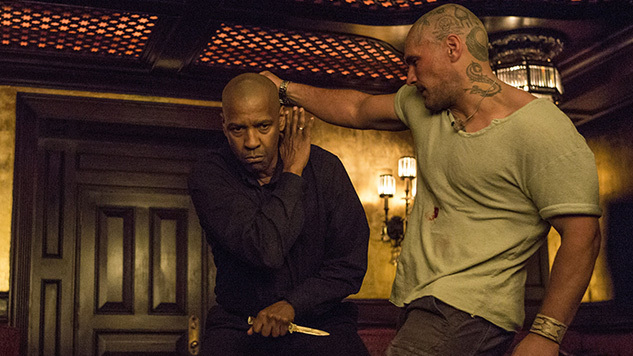 2014’s The Equalizer was a mostly unintentionally ridiculous action/vigilante fantasy about an ex super spy named Robert McCall (Denzel Washington) stripping his neighborhood of crime by murdering the hell out of anyone he deemed to be a bad egg. His superpower was low expectations: Looking like a sullen, stoic, middle-aged schlub, he could execute his enemies before they could formulate a second thought. In McCall’s world, everyone is either a faultless angel who desperately needs saving, or an evil parasite who needs to be eradicated. This worldview drove our hero toward some morally bankrupt behavior, like bludgeoning a kid to death with a hammer because he robbed the Home Depot he works at, then returning the hammer because “stealing is wrong.” Portrayed as such an untouchable badass, McCall took the action movie trope of the protagonist walking away from an explosion in slow motion and pushed it to its limits, standing two inches from the fire. For those who spout a zero tolerance approach to crime, the movie was inspirational, but for the most of us it could be a dumb, fun time at the movies with Denzel Washington. The first mistake The Equalizer 2 makes is to chuck out the premise that made the first film at least a tiny bit unique in favor of a languidly paced and tragically predictable spy thriller wherein McCall is tasked with exacting revenge for a slain friend from his old days. We can immediately predict which friend is going to the chopping block, and which one will be revealed as a turncoat, especially considering the actor cast in the role had the exact same responsibilities in another recent action sequel. Everyone seems bored making this unnecessary follow-up, from director Fuqua to DP Oliver Wood, who underexposes a handful of shots to the point of creating immediately noticeable digital video noise. Washington is in autopilot mode, his meager task to be silent and fake a mildly meek persona until he releases the beast that leaves no bone unbroken and no ligament uncut. Quick and slick fight sequences, emphasizing efficiency rather than showmanship, are few and far between, and the filler we get runs out of steam before it even gets going. The third act does offer a substantial shootout, but because it takes place during a storm, CG filters obfuscate every shot to make sure we can’t tell what the hell is going on. There’s some neighborhood vigilante stuff peppered here and there as an afterthought, like McCall inspiring a local kid (Ashton Sanders) to keep pursuing his artistic ambitions while staying away from his gangsta friends, yet that doesn’t register beyond “after-school special with added gunplay.” And why does the sub-plot about McCall’s relationship with a Holocaust survivor (Orson Bean) who’s fighting the courts to have his family’s painting returned to him exist at all? Without much forward momentum and narrative reasoning, awkwardly coming to a resolution at the very end of the film, the sub-plot reeks of last second reshoots to artificially pump some personal touch into the project. Some morally intriguing situations pop up occasionally, character beats a smarter film could subvert into something original. At one point, McCall tells the bad guy that he will brutally end his life for what the man did to his BFF, all while casually playing with the bad guy’s cute-as-a-button little daughter. How many times have we seen that trope enacted by a villain in countless movies? In this case, it’s our hero who’s doing it. Will director and Washington’s frequent partner in crime Fuqua do something, anything with that moral gray? Nope, McCall is an angel of vengeance personified (literally referred to as “The Hand of God” at one point), and screw you for even considering questioning his motives and actions. Apparently The Equalizer 2 is Washington’s first ever sequel. In this case, that’s not something to celebrate.